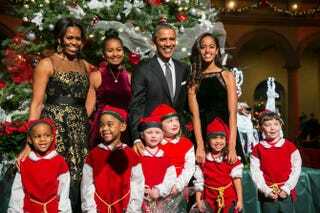 President Barack Obama, first lady Michelle Obama, and their daughters Sasha and Malia pose with “elves” prior to the taping of TNT’s Christmas in Washington program on Dec. 14, 2014, in Washington, D.C. It was just a couple of weeks ago that President Barack Obama pardoned a turkey and his two teenage daughters were doing what teenagers do best—looking as if they had plenty of other things to do. I mean, do you blame them? Pardoning a turkey isn’t exactly the highlight of someone’s day. Sasha and Malia Obama received tons of scrutiny for what some people perceived as their bad attitudes and grimaces they donned. But no one came under fire more than a former GOP communications director, Elizabeth Lauten. Lauten not only criticized the first daughters, but she pretty much said their attire looked more appropriate for the bar than turkey pardoning. Lauten received backlash online after her inappropriate Facebook post was tweeted, and she eventually resigned from her job. The girls looked amazing. Let’s not forget to mention that Barack and Michelle Obama looked pretty darn good themselves. So maybe being surrounded by little children and celebrating the Christmas holiday is something more appealing to two teenage girls. But then again, anything has to be better than seeing your Thanksgiving dinner being pardoned.